Jeans can be green. The icing on donuts can be green. Last year Jon and I drank green beer so heavily dyed that our tongues turned green. The popsicle affect, only with alcohol. And so it is with great anticipation that I bring out the food coloring to make green red velvet cakes. This recipe – minus the green – comes from Martha Stewart. It works particularly well here because it has less coco powder than some recipes – coco gives the cake its flavor, but makes the color darker. 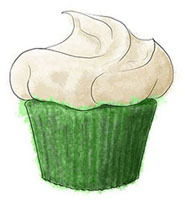 This entry was posted in Uncategorized and tagged cupcake, green cake, green velvet, Irish, st patrick's day. Bookmark the permalink.